What Comes Next for Coworking Spaces? It has been said that a good idea can come from anywhere. If your ‘anywhere’ just so happens to be a coworking space, those good ideas are flying fast and furious all day long. No matter your degree or job description, coworking spaces foster the kind of unique, collaborative environment that more and more businesses are trying to capture. There’s a reason the word ‘campus’ gets tossed around in business so much. It’s especially fitting when discussing coworking. In these spaces, the vibe isn’t that far off from a college dorm where multiple majors live and work independently of one another, but share certain common areas. It’s in these areas that bonds are formed and the benefits of having an unbiased ear nearby are most apparent. For businesses, this can result in increased productivity, more energized teams and breakthrough innovations. Over the last several years, the coworking market has grown exponentially. Not surprisingly, its growth coincides with the latest startup boom. As entrepreneurs launch their next great idea, they need dedicated work spaces where their businesses can flourish. For many startups, as well as more established companies, location is key to luring the right talent to the office. Traditional office spaces in an urban setting offer employees the unmatched conveniences and creative sparks that come with city living. However, a more suburban locale affords companies additional square footage, which can be used toward more attractive amenities – not to mention the typically lower cost of living in suburban markets. With many larger companies moving to suburban campuses, there is more opportunity for coworking spaces in traditional urban settings to bring some of that suburban comfort and convenience into the city. A variety of different business models have emerged to meet this growing demand, but the challenges remain, particularly when trying to bring the coworking philosophy to a traditional office space. How can building owners adapt and adjust to a tenant’s growth to slow down turnover? What kind of lease agreement is the most beneficial to both parties? What kind of shared environment results in the most satisfied tenants? One group that’s attempting to face these challenges head-on is WeWork. 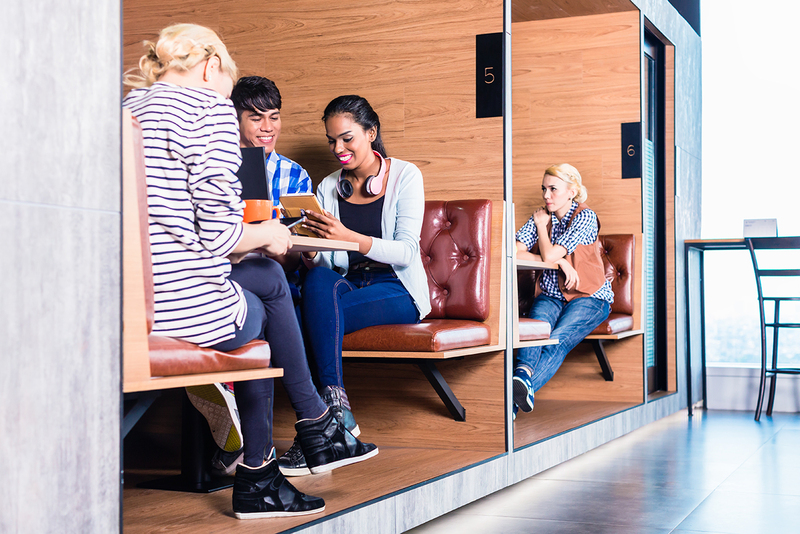 According to its research, WeWork estimates that by 2020, half of large companies will have some form of shared office space. While the company has traditionally served as a safe haven for freelancers and entrepreneurs, it has also begun courting larger clients in the enterprise. The company isn’t simply buying real estate within office buildings; they’re offering an array of options to meet the needs of their clients. These offerings can take the shape of a few hoteling desks on a floor, a complete takeover of several floors, or even the purchase of an entire building. Bringing an independent, entrepreneurial eye to coworking design for the enterprise brings with it several unique challenges. 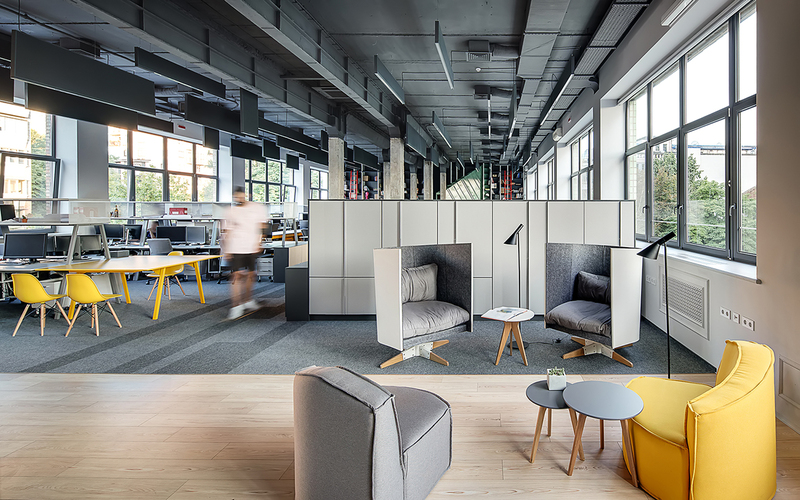 While organizations like WeWork have gotten the ball rolling, it will be up to designers and architects like our teams at INTEC Group to raise the bar for coworking’s future. As more companies choose to utilize these kinds of spaces, how will their needs for growth and flexibility be addressed? 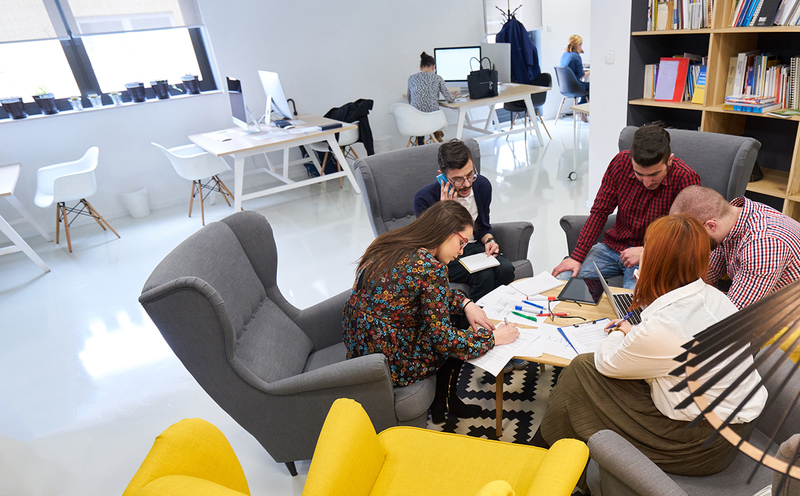 Businesses don’t want to constantly be changing addresses and moving offices so coworking spaces should be designed from the very beginning with growth in mind. 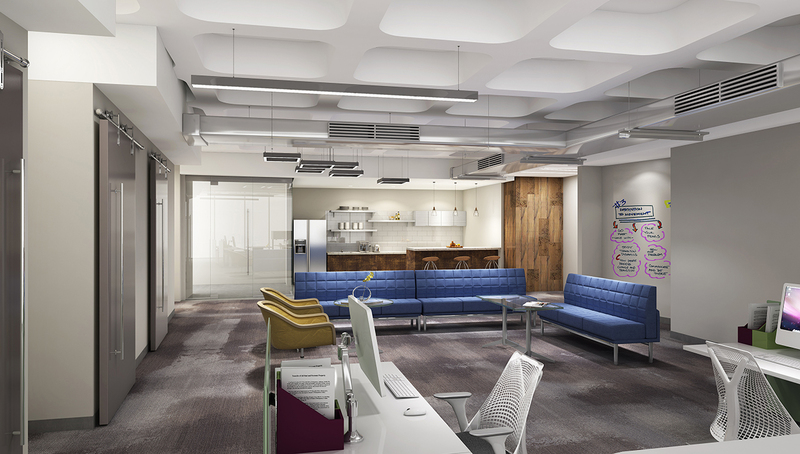 Say one tenant prefers a more open atmosphere while another enjoys individual offices for its employees. Dynamic partitions that can be moved to increase or condense space as needed can address both of their concerns. Branding is another consideration that should be made early on. Digital LED boards are an ideal solution for large, vivid branding imagery that boldly states the presence of the tenant, but can be altered or changed as regularly as needed. Looking beyond the physical aspects of the space, the real key to coworking success is the people. Businesses who choose to occupy coworking spaces aren’t simply opting for the building alone. They want to be surrounded by intelligent, creative people that could possibly help stimulate new ideas or even become partners. Designers should take occupancy into account before building out the space. At INTEC, we’ve entertained dueling ideas of filling coworking floors with a variety of tenants — a law firm, an insurance group, a strategy consultancy — or fostering an environment of healthy competition by filling the floors with different organizations within the same industry. The ultimate goal when designing this kind of space is to make it attractive enough for tenants to occupy, but more importantly, flexible enough for those same tenants to stay throughout the growth of their company. The idea isn’t that far removed from the thought process behind buying a home. You want a space that you can grow into, not just something that can hold whatever you’ve got at the moment. In this age, when a live/work balance is so highly sought after, coworking spaces should be built to feel like permanent places that companies can call home, preferably one with awesome neighbors.